Demonstrators showed up at the Museum of History as the Museum showcased a Big Oil sponsored exhibit for the Canadian Museums Association conference. Here are the highlights. The demonstration caused quite a stir. 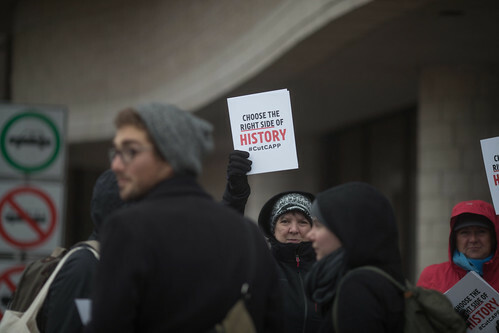 Despite the Museum’s management advising conference delegates to avoid the group, many delegates came outside to ask questions about the relationship between CAPP and the Museum, and to show support for opening up dialogue about oil sponsorships. This was an eye opening experience for many people who truly believe that the Museum of History can do better. It’s time for the Museum to follow the leadership of institutions like the American Museum of Natural History in New York and the Tate Modern in London — both of which ended their relationship to to Big Oil. It’s time for Canada’s most iconic museum to #CutCAPP. Make sure you sign the petition and share it with your friends!